London - The U.S. Justice Department has charged WikiLeaks founder Julian Assange with conspiring with Chelsea Manning to break into a classified government computer. 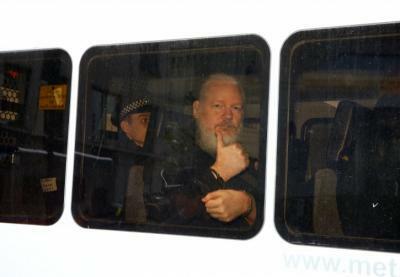 The charge was announced Thursday after Assange was taken into custody in London in connection with a U.S. extradition request, as well as for breaching U.K. bail conditions in 2012. His lawyer has previously said that Assange planned to fight any U.S. charges against him. The indictment accuses Assange of assisting Manning, a former U.S. intelligence analyst, in cracking a password that helped Manning infiltrate Pentagon computers. Ecuador’s government says that as part of its decision to expel Julian Assange from its embassy in London, it has withdrawn the Ecuadorian citizenship he was granted last year in a failed attempt to end the activist’s tumultuous stay at its diplomatic mission. Ecuador also accused supporters of WikiLeaks and two Russian hackers of attempting to destabilize their country. Interior Minister Maria Paula Romo said in Quito a close collaborator of WikiLeaks had traveled with former Foreign Minister Ricardo Patino this year to several countries, including Peru, Spain and Venezuela, in an attempt to undermine the government. She did not identify the individual but said their name, as well as two Russian hackers working in Ecuador, would be turned over to judicial authorities in the coming hours. Baltimore, MD - Apr. 19, 2019 - BJL wishes a hearty Mazel Tov to Rabbi Yisrael & Mrs. Batsheva Neuberger on the birth of a son Mazel Tov to grandparents Rabbi Moshe & Rebetzin Mindi Hauer and Rabbi Meir & Mrs. Rivky Neuberger (Atlanta) and great-grandparents Rabbi Yaakov & Rebetzin Freda Hopfer and Mrs. Edith (Rabbi Ari, ZTL) Neuberger יה"ר שיזכו לגדל בנם לתורה, לחופה, ולמעשים טובים. אמן!